The compulsion to walk yet another Camino de Santiago trail draws Susan Alcorn to the north coast of Spain. In Healing Miles, her vision is hiking through lively cosmopolitan cities and remote hilltop villages, pausing to sample delectable pintxos in coastal San Sebastian and sip sidra (hard cider) on Oviedo's trendy Calle Gascona. She finds that and more. There is the challenge of walking many miles each day, but there is also time to gaze out upon long stretches of sandy beaches, witness the ocean's moods as it blasts seawater up through blowholes, and look out from mountain paths across valleys blanketed with fog. Layover and shorter days provide opportunities to visit museums, Neolithic cave paintings, and cathedrals. And throughout, there are rich experiences with others--bonding with new people, sharing news with friends at home, listening to local bands, and happening upon colorful festivals. Yet, she also sees that life goes on--no matter how much you want to do something, your body may protest, and no matter how remote the journey seems, news may arrive from home that a family member needs more care--stressing you to your utmost limits. At 74, Susan Alcorn sets out to hike across Spain on two lesser-known, and more difficult, Camino de Santiago pilgrimage trails--the Caminos Norte and Primitivo. This is not an easy venture, no matter what your age. 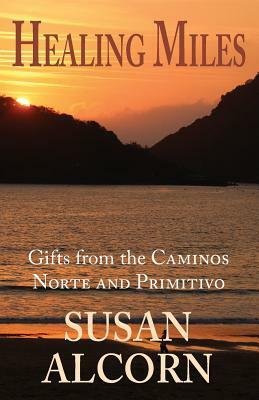 Though not everyone has the time or inclination to walk seven-hundred miles across Spain as she and her husband did, all can appreciate the struggles and joys of walking the Camino Norte route along the Bay of Biscay, and of both the Norte and Primitivo Camino routes as they cross the mountains to arrive in Santiago de Compostela. Those contemplating walking either of these trails will enjoy the substantial section of practical information. They will learn how to plan and pack for such an adventure, the pros and cons of albergue life, and what to expect in the way of weather, terrain, and trail signage. Throughout Healing Miles you'll find a larger story--one that's certain to be familiar to many--aging. The author must confront the issues of her own not-so-young body and her mother's decline. Doing so is not an easy task, but with her own determination and the gifts from others as well as from the trail itself--she does so.